What's the first thing you look for in a smartphone? I bet it's the price! Then what? Suppose there are 2 smartphones with the exact same price tag, would you be confused in deciding which to buy? After all, most smartphones have more or less the same features, namely a fast processor, dual SIM, a nifty camera (maybe two) and a touchscreen. So then you end up comparing each nitty-gritty detail of both the smartphones. This is what's going to happen if you have half a mind to buy the Lenovo K3 Note which was launched in March but have an eye on the newest launch this month from the Gionee smartphones stable: the Gionee F103 smartphone. Both have the exact same price tag, namely Rs.9,999. You thus would be eager to compare the features & service of these two really smart smartphones. Looking at the two smartphones, do you go "Wow!" right away or is it that you are indifferent to their looks? Most smartphones nowadays have very little distinctive features that make them stand out as far as looks are concerned. In the case of the Gionee F103 what stands out is that it is nestled within a mirror glass back & metallic frame, whereas the Lenovo K3 Note comparatively looks a little ordinary. In fact, the 'F' apparently refers to it being a fashion model. Perhaps too a few curves will differentiate them! Then there are the colours. In the case of the Lenovo K3 Note, you can select between the usual black or white or opt for yellow, whereas the Gionee F103 comes in 2 shades of white – pearl & dawn – as well as black. Of course, if you are not very particular about colours, why bother?! Moreover, you are quite likely to put the smartphone in a sleek wallet cover, so that will hide the colour anyway. Speaking of looks, you next think of the monitor that faces you, namely the screen. On the Gionee F103 what you're staring at is a 5 inch display with a resolution of 720x1280 pixels. The Lenovo K3 Note is a tad better with a 5.50 inch screen packed with 1080x1920 pixels. Both have HD Display with Dragontrail glass protection. From various viewing angles they both seem to be equally good. How about the snap shots? Not everyone is too bothered about the camera unit in a smartphone, but in today's mad world of taking shots of just about everything (including one's egoistic self! ), it does seem to be an aspect to consider. Checking out the Gionee F103, you get an 8MP auto focus camera at the rear having f/2.2 aperture and incorporating a LED flash. The front-facing camera is 5MP with f/2.0 aperture. In the Lenovo K3 Note the front camera is the same, namely 5MP, while the rear camera is truly impressive, being 13MP with dual LED flash. If you are buying the smartphone keeping in mind camera features, it is a good idea to check how the images come out from both the devices in low light. We all know from experience with even cameras how shoddy a scenery or a person looks when there is poor lighting around! Keeping the heart beats ticking in the Lenovo K3 Note is a 1.7 GHz octa-core MediaTek MT6752 processor with the support of the Mali-T760 GPU. In the case of the Gionee F103 smartphone, the processor make is the same, namely MediaTek, but the difference is the type – here it is a quad-core MT6735, clocking in at 1.3GHz. We thus have 2 smartphones which would give good performance generally, but to test them to their fullest capacity you would need to use them for heavy gaming activities & video-watching. How much can I stock up? Storage is one thing we want plenty of – and not just in our home. We are not going to be happy with cramped quarters in our smartphone either! Here, the Lenovo K3 Note scores high. It not only is packed with 2GB of RAM and 16GB of built-in storage it even has provision to for 64GB additional space via microSD cards. The Gionee F103, on the other hand is having 2GB RAM and 16GB Internal memory but there is no mention of provision for upgrade to 32GB or higher. Ah! Here's the crux of the matter – does the OS of the device provide good performance? Both the Gionee F103 and Lenovo K3 Note are functioning on Android 5.0 Lollipop OS, but the former is supported by Amigo UI 3.1 and the latter by Vibe UI 2.5. The Lenovo K3 Note's plus point is the ability to remove any pre-installed apps which you are not really going to use. It is like having those over 100 TV channels – totally pointless! After all, there is no point in cluttering your smartphone with apps that will drain the battery in no time. What's more, it is great to have a lock code feature to ensure only you are privy to certain data. There is even a power saver setting to disable little used functions and increase the standby time. It seems the Lenovo K3 Note does give a power packed performance as per the feedback of many users who have given it a big thumbs-up for being a strong multi-tasker even though it does not score very high with its battery. The verdict on the Gionee F103 needs to be awaited from those few lucky enough to get their hands on it to preview. 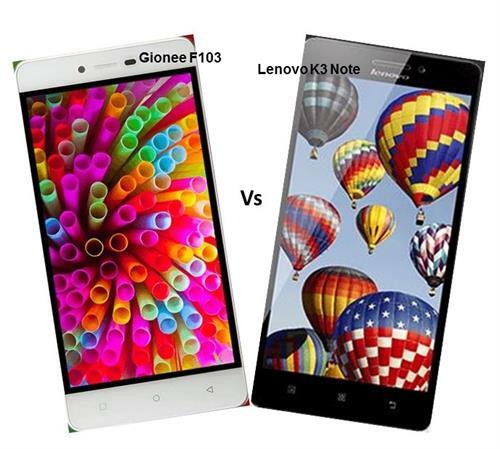 As you can see from the above comparative details, you can choose the Gionee F103 for its fancy looks or go for the Lenovo K3 Note if you are not too bothered about its simple lines – after all, performance is what you should go by is my personal opinion. By the way, those who have used the Lenovo K3 Note have complained about the placement of some of the buttons, saying it takes a lot of time to get used to. So if you get your hands on the Gionee F103, check out how it fares in comparision and drop in a comment below.